Nishat Tasnim, an international student from Bangladesh, volunteers each year during UBC Okanagan’s Days of Caring program which runs during reading week. This year, she’s helping out at Kelowna’s SPCA. For many university students each year, reading week is a welcome interlude. It’s a time to catch up on lecture notes or assignments, see old friends, or simply veg out at home. Some opt for ski trips and others head south to vacation hot spots, to get away from it all. But for many UBC students, reading week—running Feb. 17 to 21—is a chance to get involved in community initiatives, collaborating with both the young and the old, and in some cases, the four-legged kind. Nishat Tasnim, an international student from Bangladesh who lives on UBC’s Okanagan campus, is one of many students participating in the Days of Caring Community Service Learning program this week. 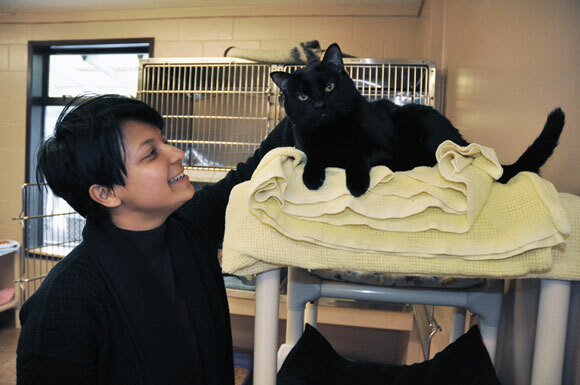 She’s volunteering at Kelowna’s SPCA—helping to build condos for the shelter’s adoptable cats. This is Tasnim’s third year volunteering during reading week and she says her volunteer experiences have helped her learn how to paint large walls, help at registration booths, ask for donations, prepare food, organize inventory, and mentor middle school students. She’s thrilled to be able to find some spare time to help out the community around her, and while it may sound corny, she openly admits, giving her time to help others is simple payback for the great things going on in her own life. Phil Bond, Community Service Learning program manager at UBC’s Okanagan campus, says the popularity of the program has grown phenomenally in three years and he’s happy to help match students with volunteer opportunities. When Days of Caring Reading Week started three years ago, they had a hard time filling the volunteer positions. This year, students are on a waiting list.